Microsoft’s Notepad is quick and light on resources. After that it doesn’t have much to offer. Here’s two very simple and quick methods of changing Notepad to a more robust program of your choosing. I use Notepad++ as my default text editor and for SQL, HTML, CSS, .htaccess, quick lists & notes, opening Unix based read me files, file comparisons and much more. 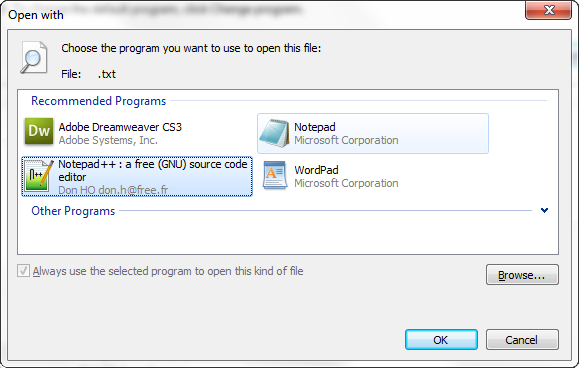 Notepad++ is lightweight and fast but also very powerful and it’s free via GPL License. Thanks, step #1 worked perfectly!